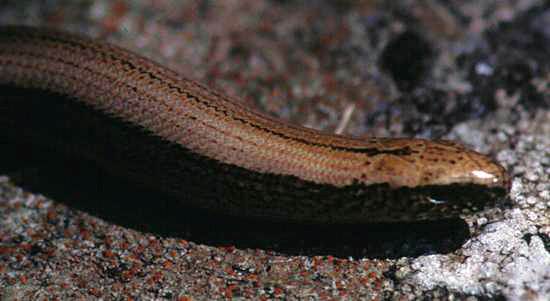 Although they look very much like snakes, Slow Worms are in fact legless lizards. 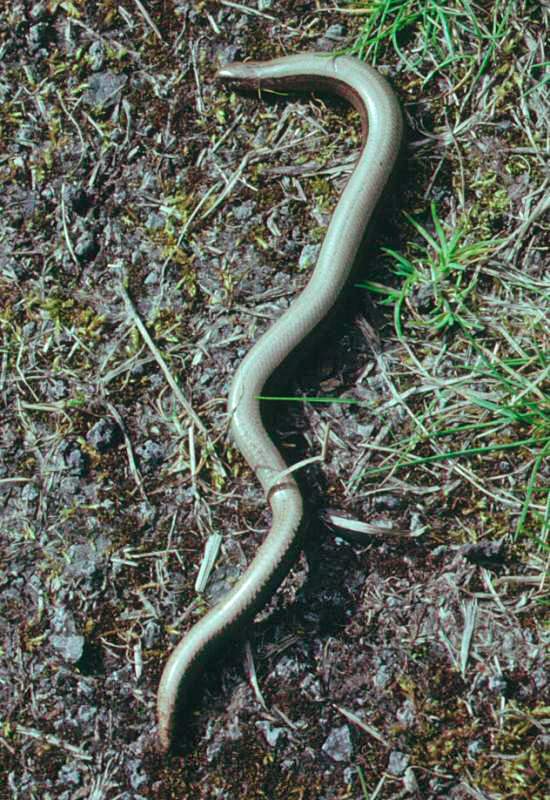 The most distinctive feature of the Slow Worm is an almost complete absence of identifying markings on the body, although some females are found with a thin dark stripe along the back. Slow Worms vary quite a lot in colour, from a bright coppery brown to a leaden grey. The females tend to be brownish, while the males are usually more grey; both are quite shiny in appearance. As with the other lizards, they have eyelids and are able to blink and to close their eyes when resting; snakes, on the other hand, have no eyelids. Found across most of Europe and Asia, this burrowing reptile spends much of the time either under rocks, tree branches or other objects lying on the ground or in shallow holes in soft dry soil. They are often found by gardeners who are turning over material in their compost heaps. 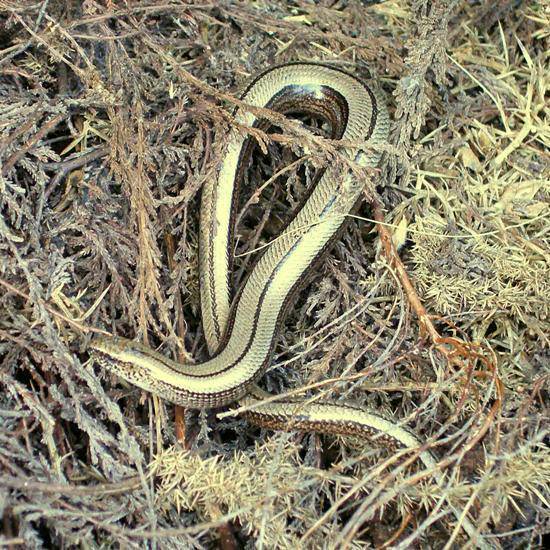 You will usually find slow worms only in places where there is plenty of cover: in the open they can sometimes be seen crawling among long dry grass or amidst soft soil and undergrowth with somewhere nearby where they can sun themselves but almost always close to a bolthole - a rock hollow, a fallen branch or (very often) discarded sheet metal. When old corrugated iron sheets are left beside buildings, Slow Worms are very likely to take up residence there, and they will even hibernate in such places. Slow Worms are popular with gardeners who are 'in the know' because they eat slugs and snails. They are also partial to worms, spiders and any insects they can catch. These harmless reptiles are sometimes eaten by snakes and by larger birds; however they probably have most to fear from humans who mistake them for snakes and kill them in the mistaken belief that they pose a serious threat to their families. Note that all native lizards (and snakes) in Britain are protected by law, and it is an offence to harm them in any way - including offering them for sale. Please leave them alone, and maybe we can halt what has been a remorseless decline in their numbers in recent times. Like other reptiles, Slow Worms hibernate during the cold winter moths. In Britain they emerge from hibernation in March, and by late May they have come into condition ready for their breeding season. Slow Worms are viviparous (giving birth to young in a thin membrane that bursts to release the young as soon as they emerge from their mother), usually in September or October. Brood numbers range from 3 to more than 20, and the young, which are pale golden brown on top with greyish silver undersides and typically 8 or 9cm long, take about three years to reach maturity. Adult Slow Worms can live for up to 30 years in the wild and even longer in protected captive environments, and they can reach a length of 40 to 50cm. This page includes pictures kindly contributed by Simon Harding and Bob Osborne.